The Lakeland Beard Care Morning Dew Beard Oil is hand made in Cumbria UK in small batches by owner and creator Richard Briscoe. The oil, like all of the Lakeland Beard Care products is made using natural ingredients and they all have a CPSR (Cosmetic Product Safety Report). The 30ml Morning Dew beard oil contains Sweet Almond, Argan & Jojoba carrier oils. This blend left my beard feeling softer, however my beard also had a dry feeling to it and I have had this on a few ocassions with other beard oils. Our beards are all different and tend to favour different carrier oils. Of course this blend of carrier oils also takes care of the skin underneath the beard and so it is important to really work in these oils and get them down onto the skin. This will help to prevent that itchy sensation that can plague bearded guys and it will help to keep the skin and follicles in good condition. The Morning Dew scent is a blend of Scots Pine, Cedarwood & Clary Sage and the scent is Piney, Woodsy, Earthy, slightly sweet & floral and whilst I woodsy scents are not for me, this is a very nice scent blend. 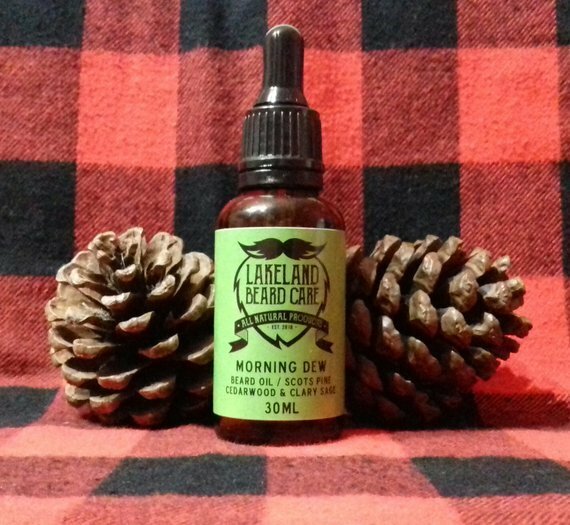 The Lakeland Beard Care Morning Dew beard oil comes in a 30ml glass bottle with a glass dropper to dispense the oil and costs £11.99 from their Etsy Shop.